As a pastor, author (penning a massive exposition of Hosea), and member of the Westminster Assembly of divines, Puritan Jeremiah Burroughs (1599-1646) is best known for his classic work The Rare Jewel of Christian Contentment. In typical Puritan style, this volume is clear, illustrative, and full of warm appeal to the heart. 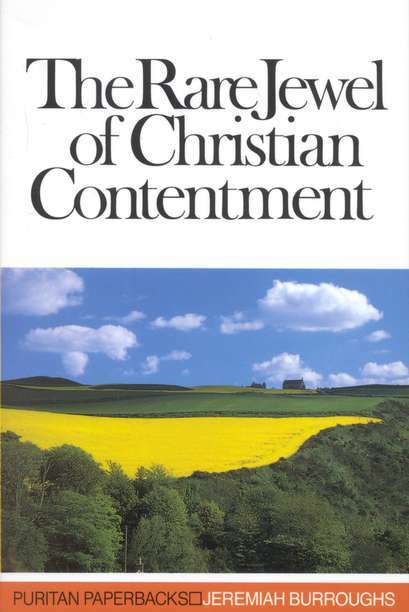 Burroughs defines contentment as: “That sweet, inward, quiet, gracious frame of spirit, which freely submits to and delights in God’s wise and fatherly disposal in every condition” (19). He explores many facets of contentment, including Jesus’ take (chap. 5-6), the sin of murmuring (8-10), thirteen excuses of a discontented heart, and directions for attaining contentment (chap. 12-13). The author presents contentment as both mystery and paradox. The most contented man in the world is also the most satisfied. The man who has learned how to be content with his place in life is also most unsatisfied with the pleasures of this world. “A little in the world will content a Christian for his passage, but all the world, and ten thousand times more, will not content a Christian for his portion” (43). A Christian often does not reach contentment by addition but by subtraction. When we subtract our desires to fit our circumstances, we will be content. Contentment of the soul is like a man who warms his wet cloths with his own body heat, whereas a sickly man must warm his clothes by some outside source (28). Discontentment comes when desires and circumstances are not equal, like the man who can walk more comfortably with two short legs than the man with one long leg and one short (46). Seeking contentment from outside circumstances is like a sick man who puts sugar in his medicine to make it taste better (55). The man who seeks contentment from worldly things is like the craving stomach that seeks satisfaction by sucking in the wind, then concluding that he is dissatisfied because he did not take in enough wind. But this man is dissatisfied because the wind is not suitable for a craving stomach. Why are we discontent? “O poor deluded man! It is not because you do not have enough [worldly comforts], but because it is not the thing that is proportional to the immortal soul that God has given you” (91-92). The Puritans were masters at saying the same thing many different ways. Burroughs takes over 200 pages to express to us the meaning of contentment in terms we can understand. Read this for warmth and illustration.